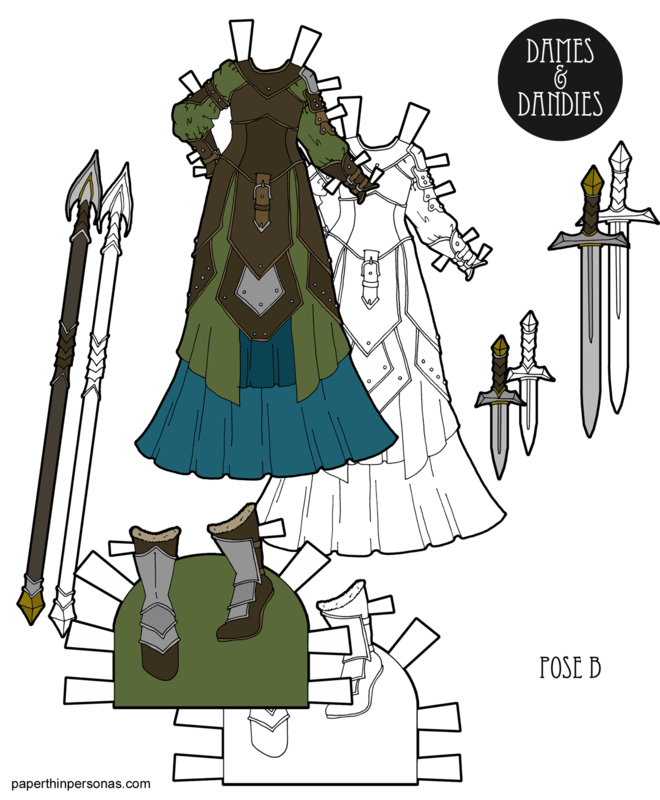 Originally, this gown/armor thing was a design I had created with the intention of drawing it for the Sprites paper dolls. However, since that series ended, it was one of the few pieces I was so in love with that I couldn’t imagine getting ride of it. 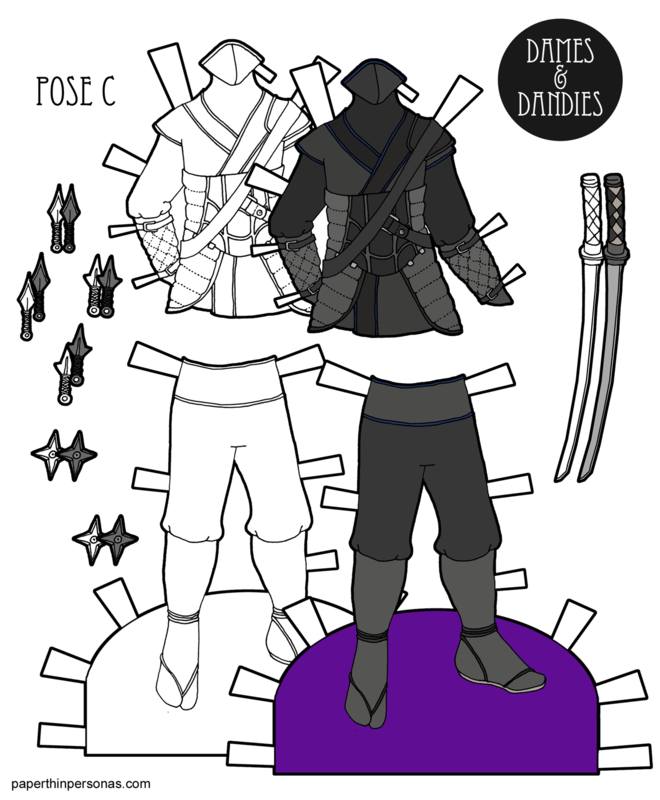 So, I redrew it for the B Pose paper dolls. I’m not sure if this armor is decorative or not, but I loved the idea of a fantasy gown which was also fantasy armor. So often women in fantasy end up wearing men’s style armor and I wanted to engage in the idea of elegance and strength. I imagine this armored gown as something beautiful, but with an underlying practicality. It’s not really an armored gown as much as it is a gown that could also be armor. I was inspired by this image, this image, and this image from Pinterest. Plus, probably a lot more from my Fantasy Armor and Fantasy Clothing Pinterest boards. 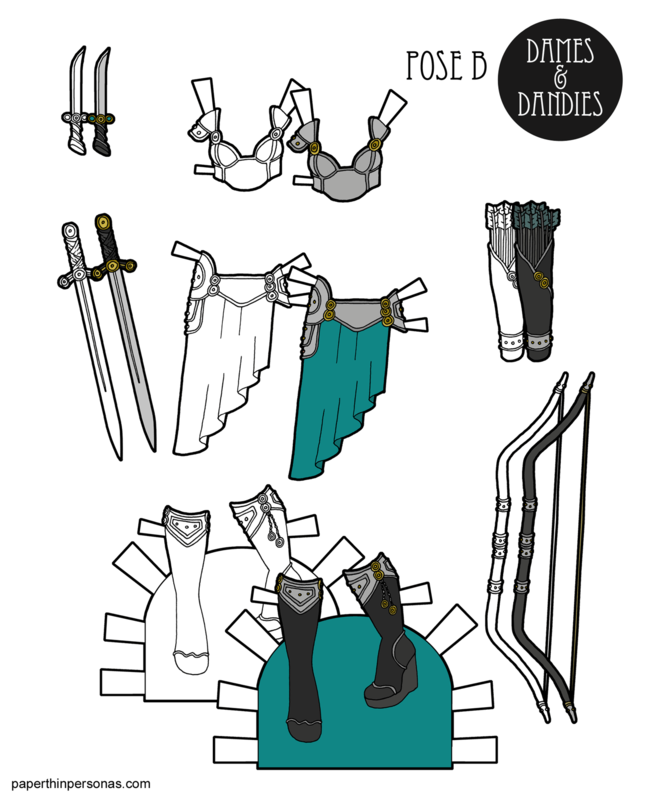 I feel odd picking out favorite paper doll outfits, because I love drawing my historical stuff as much as I love drawing fantasy stuff, but this is probably one of my favorites for the moment. What do you think of it? Let me know in a comment and if you love the blog, consider supporting it through Patreon. Need a doll for today’s paper doll clothing? All the B Pose Dolls & Clothing. Because working full time and going to school is hard, I have been trying to get a whole week’s of blog posts scheduled each weekend. As, I sat down to schedule this next week I was struck by the lack of content. 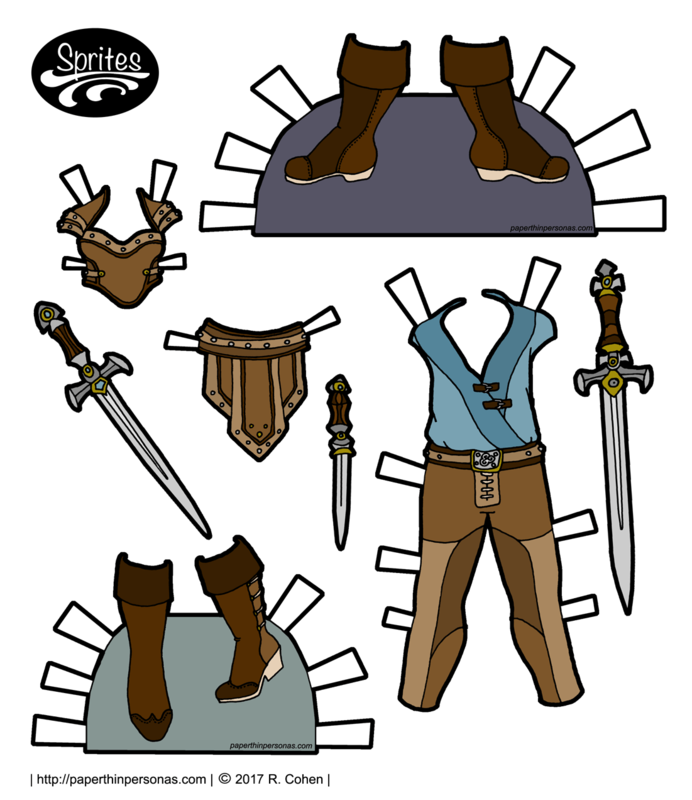 While I was worrying about how I was going to get through the next two weeks, I stumbled across today’s pulpy fantasy set for the Sprites paper dolls. I don’t know why I had forgotten about it. It was all done, except for layout. Why I hadn’t done the layout, I don’t know. I drew and colored it at the same time I colored the Regency set and this fantasy set that I posted earlier. Still, who I am to look a gift horse in the mouth. So, this Monday here’s a new Sprites set. I love pulpy fantasy sets. I blame this on having watched a lot of Xena: Warrior Princess at an impressionable age. 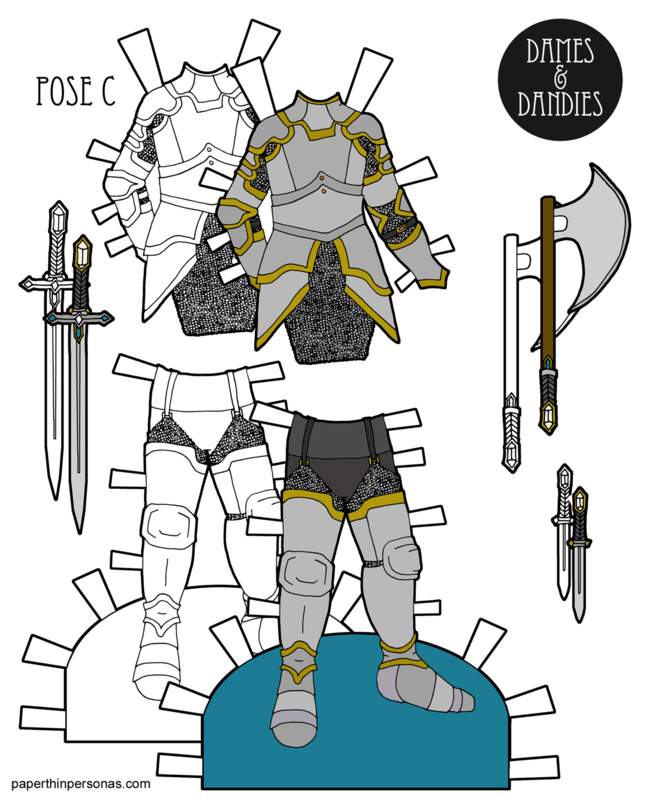 I also feel like I draw enough practical paper doll armor, that I can get away with also drawing totally impractical paper doll armor. As for the rest of the week, on Wednesday there will be a new addition to the Poppets 1920s collection. Friday, you can look forward to the September edition of the 2017 Paper Doll Collaboration.